SugaChef Padua Player is presenting the Extreme Sweets Showcase, a good-natured contest between two young Food Network stars Alex Portis and Matthew Merril. Other special guests include radio host Sunni of “Sunni in the City,” Real Housewives of Potomac star Robyn Dixon, ABC7’s Michelle Marsh and former NBA star and activist Etan Thomas. Besides creative tasting plates and signature cocktails, guests will enjoy live music by Buzzard Point Caucus, live paintings created on site by fine artists and live and silent auctions featuring exclusive gifts and experiences, including tickets to Hamilton. Each ticket purchased will help reach the Mission’s goal of feeding and caring for one million souls this winter. Last year, over 400 people attended wearing their favorite “soles” while donating money to help with their neighbors in need. 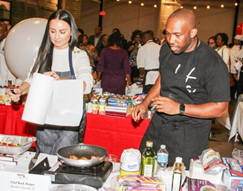 To attend and learn more about all of the participating chefs, hosts, and local celebrities click here. Central Union Mission is a faith-based 501(c)(3) nonprofit. In addition to its emergency shelter program, the Mission operates a rehabilitation program for men with life-controlling issues, clothing and furniture distribution center, a retreat and recreation center with a camp for underprivileged children and a ministry to families and senior citizens. For additional information, contact Senior Director of Strategic Partnerships and Community Engagement Deborah Chambers at cell: 202-534-9965, or visit www.missiondc.org.